Preheat oven to 180°C/350°F; line two large baking sheets with baking paper. Beat butter and sugars in an electric mixer until light and fluffy (2-3 minutes), add eggs and vanilla and beat well to combine. Sift over flour, cocoa, baking soda and salt, stir to combine, then stir in chocolate and sour cherries. Roll heaped tablespoons of mixture into rough balls, flatten slightly and place on prepared sheets 5cm (2in) apart. Bake until puffed and starting to set (8-9 minutes). Cool slightly on sheets then transfer to a wire rack to cool completely. 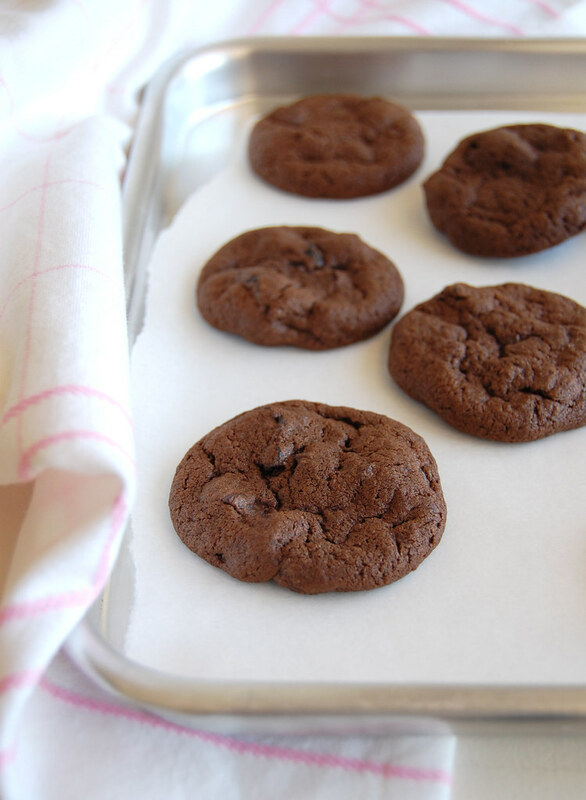 Cookies will puff while baking and flatten while cooling. I love feeling the taste of butter in cookies and the easiness to handle the dough. For sure, putting chocolate and cherries together must take you straight to heaven. Gorgeous! Thanks for this lovely recipe! I just happened upon your lovely blog. I'm now your newest follower. Awesome! I love quick and easy recipes, especially during the summertime. By the way, I made those Cocoa Brownies you posted a while back (in June, I think). omg. omg. omg. They are killer amazing! So quick yet they look so delicious: and how can you go wrong with chocolate and cherry!?! YUM! I make something similar at Christmas; the combo of cherry and chocolate is one of my favorites! You must have been rolling the balls of dough pretty fast. Whenever the dough calls to be rolled,it takes me a long time to finish the whole thing, maybe because I love my cookies to be smaller. Such a pretty photo, Patricia! And I love chocolate with cherries. They look delicious! Love the choc cherry combo and they look lovely and soft and chewy. I'm looking for a good and quick cookies recipe :) Thanks! You can't go wrong with chocolate and cherries! Those look great! Victoria, thank you for stopping by! Yolanda, cherries go so well with chocolate, I agree with you. Satya, very quick, indeed! Thank you! Moogie, thank you for stopping by! I'm glad you're enjoying the blog! Mari, how are you, sweetie? I'm so glad to hear about those brownies - tks for letting me know how they turned out! Katie, thank you! These are soft in the center, yum! Magda, thank you for stopping by! Brilynn! How are you, sweetie? Mmm they look so nice and soft. Oh fantastic! These are made by Australia's Bourke Street Bakery and I can vouch for their addictive and rich chocolately qualities. By accident, mine were made with Aztec choc with a slight orange zest and spices flavour, and they were spectacular. Emma, that is great! Tks for sharing your thoughts on the recipe - and I'm now drooling over your version, I absolutely love chocolate and orange together!